Since we last reported on our drive to reform federal firearm laws ("BATFE Hearings Lead to Reform Bills," June 2006), concern about treatment of firearm dealers by the Bureau of Alcohol, Tobacco, Firearms and Explosives (BATFE) continues to rage. In response, members of the U.S. House of Representatives--with NRA-ILA's full support--have begun to push for new and improved reform legislation. 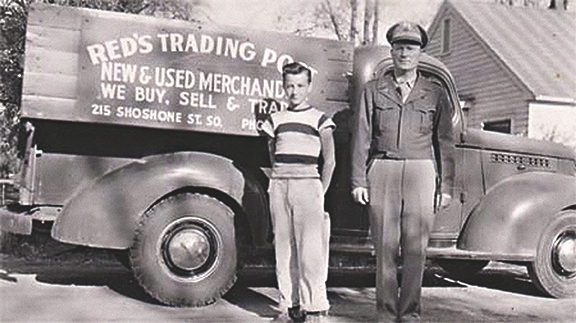 Red's Trading Post founder, Lowell "Red" Kinney (below, right) stands with his son, Jesse. Like many family-owned gun stores, Red's now fights to save its federal firearms license from revocation by overzealous BATFE officials. The bill, H.R. 4900, was introduced in January by Reps. Steve King (R-Iowa) and Zack Space (D-Ohio). It's mainly aimed at one problem: Around the country, gun stores small and large have been threatened with closure over minor, unintentional record-keeping violations. Among them--and certainly the most outspoken, through owner Ryan Horsley's widely read blog on the Internet--is Red's Trading Post in Twin Falls, Idaho. Red's has been a family business since 1936, which makes it Idaho's oldest gun store. After giving Red's a clean bill of health in a 2001 inspection, BATFE found record-keeping errors in 2005, and began proceedings to revoke Red's federal firearms license (FFL) in 2006. Due to increasing concern over BATFE's treatment of firearm dealers, members of the U.S. House of Representatives are pressing for reform legislation such as H.R. 4900, introduced by Rep. Steve King, R-Iowa, and Rep. Zack Space, D-Ohio. Red's is not alone. BATFE is also pursuing revocation against a pair of stores in North Carolina, even though its own correspondence with the stores' owner commended him for making "a concerted effort to comply with the laws and regulations," and the alleged violations involved a tiny percentage of overall sales--with, for example, recordkeeping violations claimed on 80 firearms out of 16,000 sold. That case, too, will require an expensive trial to resolve. Since an FFL can only be revoked for "willful" violations, most of these cases turn on BATFE's definition of the term "willful." Congress added the "willfulness" requirement in the Firearms Owners' Protection Act (FOPA) of 1986, to end similar abuses by the agency throughout the 1970s and early '80s. BATFE has gotten around that change by arguing in court--all too successfully--that a violation is "willful" any time a dealer repeats a mistake after a warning. And it's easy for BATFE to rack up large counts of "violations" when they include errors like not recording the buyer's county of residence--even where the buyer's city and county have the same name and boundaries. H.R. 4900 would end that problem by defining "willful" violations to mean intentional, purposeful violations of the law. It would also streamline the appeal process to give dealers a better chance to defend themselves in court. Codifies limits on disclosure of firearm trace data--which Congress has already limited through a series of appropriations riders over the past three years, out of concern for gun owners' privacy and the confidentiality of law enforcement records. The provision would still allow law enforcement agencies full access to trace data for bona fide criminal investigations. Reforms the procedures for FFL applications. Under H.R. 4900, denial of an application will require notification to the applicant, complete with reasons for the denial. An applicant will be allowed to provide supplemental information and to have a hearing on the application. Permanently bans creation of a centralized electronic index of dealers' records--a threat to gun owners' privacy that Congress has barred through appropriations riders for a decade. Eliminates a provision of the Youth Handgun Safety Act that requires those under 18 to have written permission to use a handgun for lawful purposes (such as competitive shooting or safety training)--even when the parent or guardian is present. Allows a grace period for people taking over an existing firearm business to correct problems in the business's records. If a person inherits a family gun store, for example, the new owner shouldn't be punished for the previous owner's mistakes. Cleans up federal law by repealing the Brady Act's "interim" waiting period provisions, which expired in 1998. Improves the process for imposing penalties, especially by letting FFLs appeal BATFE penalties to a neutral administrative law judge, rather than to a BATFE official. Allows a licensee time to dispose of his firearm inventory when going out of business. Clarifies the licensing requirement for gunsmiths, to distinguish between repair and other gunsmith work and actual manufacturing. There have been other new twists in the attack on FFLs. BATFE agents continue to tell gunsmiths around the country they must be licensed as "manufacturers," even though the Gun Control Act clearly states that common gunsmithing tasks such as "repairing firearms or … making or fitting special barrels, stocks, or trigger mechanisms to firearms" may be performed on a dealer's license. Gunsmiths have even been told that engraving or rebluing a firearm is "manufacturing." NRA-ILA and the NRA Civil Rights Defense Fund are supporting one gunsmith's challenge to these BATFE claims. H.R. 4900 would fix this problem, too, by clarifying the definition of "manufacturer" and "dealer" to make clear, once and for all, that gunsmithing isn't manufacturing. Gun owners are rightly concerned that the ongoing problems with BATFE will continue to drive FFLs out of business. No FFLs would mean nowhere for you and me to buy guns. That would be just fine with the Violence Policy Center, the radical gun-ban group that for years complained there were "more gun dealers than gas stations in the U.S." As pointless as that comparison was both then and now, VPC hasn't been satisfied with the fact that it's no longer true nationally. Call the U.S. House today at (202) 224-3121 and ask your representative to cosponsor H.R. 4900. Instead, VPC has turned to arguing that there are still more gun dealers than gas stations in five states. Not that those states--largely rural, low-crime Alaska, Idaho, Montana, Oregon and Wyoming--should worry anyone. In 1968, Congress deliberately made it easy to obtain FFLs to ensure continued firearm supplies in remote areas. VPC mentions that "Alaska has more than three times as many gun dealers as gas stations;" that shouldn't be surprising since Alaska also has immense areas with no towns or roads at all. As restrictive as current laws and BATFE practices have been for dealers, VPC says they're not enough and demands new limits. Among VPC's ideas are that guns should only be sold from "businesses devoted primarily to the sale of firearms" (there goes the gun department at your local Cabela's or Wal-Mart), and that BATFE should be able to inspect dealers "at least" four times a year. H.R. 4900, of course, would go the opposite direction from VPC's ideas. I've personally committed myself to winning these reforms. This winter, I wrote to BATFE Acting Director Michael Sullivan to state my concern about his agency's "overly restrictive legal interpretations and overly zealous enforcement activities." Among other things, I pointed out that BATFE demands a higher level of perfection in dealers' records than it practices (according to several audits) in its own National Firearms Registration and Transfer Record--the government's database of machine guns and other devices regulated under the National Firearms Act. I went on to promise Acting Director Sullivan that NRA would continue to push for a legislative fix to the problems we've encountered with his agency. That's what we did with the Firearms Owners' Protection Act of 1986. That bill took an eight-year battle in Congress, including the use of a discharge petition--a procedural maneuver to yank a bill from the grip of a hostile committee chairman. These petitions rarely succeed, so passage of FOPA was truly a history-making event for NRA and the Congress alike. As we did 20 years ago, NRA-ILA will explore every angle to bring about these needed reforms. But now, as then, the key to our ultimate success will be the dedication and commitment of NRA members who call and write the Congress, and who turn out to campaign for candidates who support our Second Amendment rights. Call the U.S. House today at (202) 224-3121 and ask your representative to cosponsor H.R. 4900. For more information, including NRA-ILA's letter to Acting Director Sullivan, click here.